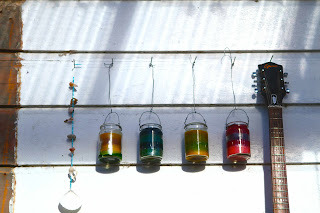 A little while ago I posted about our birhday party, and how I made some candles using some Agee jars I had lying around (after being inspired by some photos of tea cup candles in a magazine). 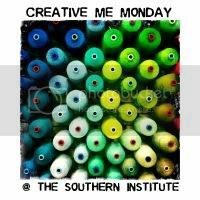 They were super easy to make, just a bit time consuming, especially since I wanted to make layers of various colors. 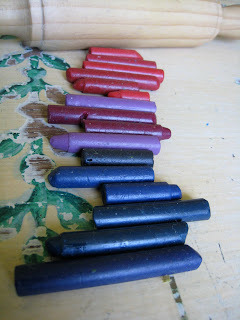 After first trying with some water based food coloring and failing miserably, I used some of Tahi's broken wax crayons. They worked a treat! 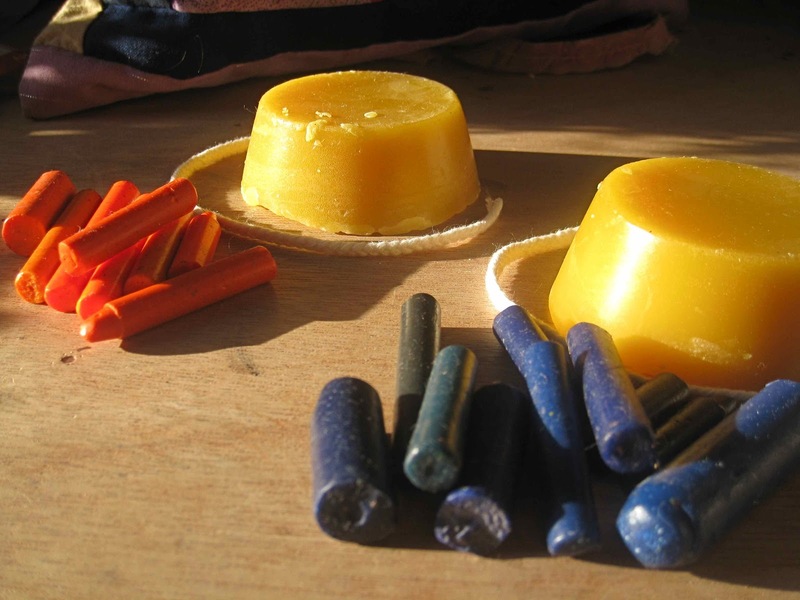 So, if you want to make some at home, all you need is some beeswax (you can buy some on Trademe), some colored crayons and some candle wick (also on Trademe). Once you've decided what kind of container you want to use, cut some candlewick slightly longer that the depth of the said container. Tape one end to a chopstick or any other stick. Rest the stick on the top of the container. You can get different thicknesses of candle wick, mine is a 60 ply. Basically the bigger the container, the thicker the wick (from my understanding, correct me if I'm wrong). 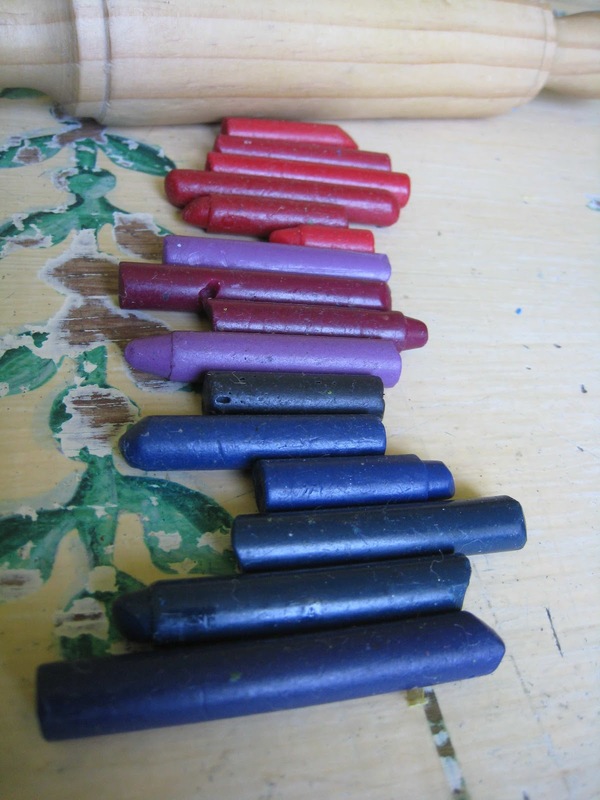 If you are going to color the beeswax, select the crayons you want to use. Meanwhile melt the beeswax in a pot. You can either use a double boiler or put it straight on the element with the heat as low as possible. Experiment with the amount of beeswax used, I used one block per layer of color, each block weighing about 70g. And if you're wondering if you can use one of your kitchen pots without ruining it, you can. Once you've finished with the melting, simply add vegetable oil to the pot, smear it all over to make sure it mixes with all the beeswax, then wash with dishwashing liquid. Your pot should be as new. Once most of the beeswax has melted, add the crayons and take the pot off the heat. 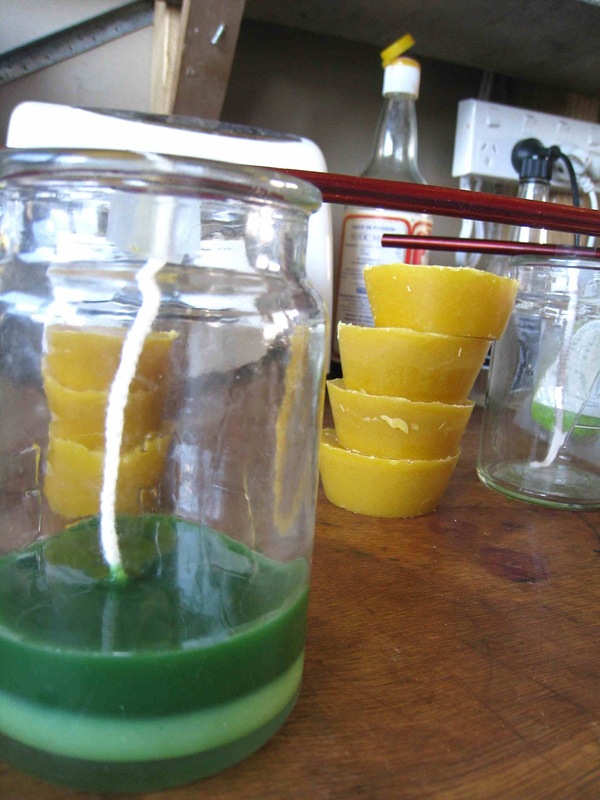 Stir with a wooden spoon until the wax is a uniform color. Add more crayons if you wish. 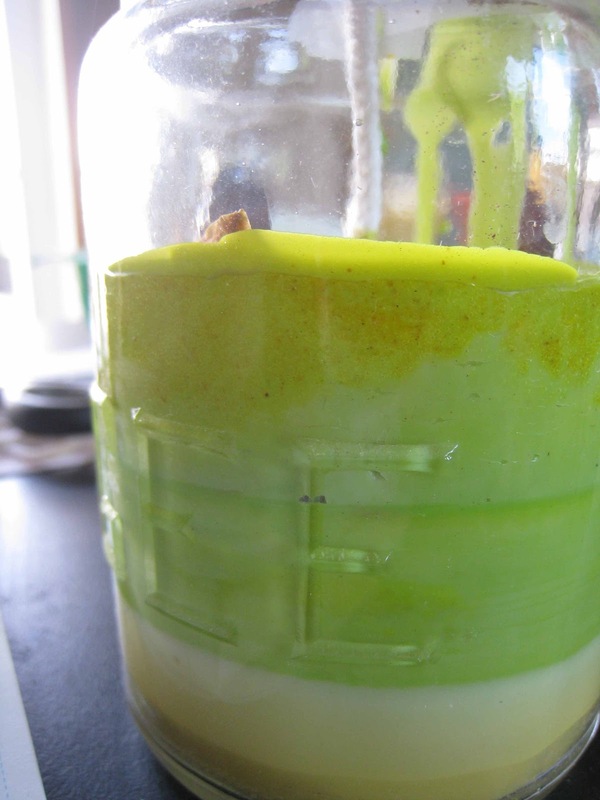 Then transfer the liquid into your jar/ teacup/ whatever container you wish to use as a candle. Voila. 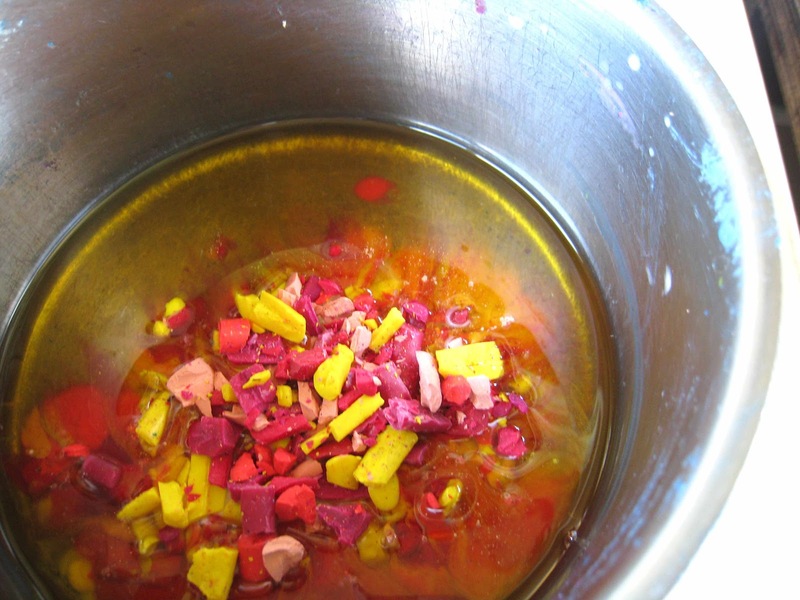 If you wish to make different layers of colors, make sure you wash your pot in between colors, otherwise you might end up with a dark brownish wax for your last layers! Leave the wax to cool. Make sure the previous layer has cooled down completely or the two layers will mix! I also experimented with how much to fill the jars and found that leaving about 5cm gap at the top worked best for a good bright flame. The jars that were filled pretty much to the top weren't as bright and tended to go out (mainly because of the wind). This is the result of my first jar. You can see the layers of colors are not that different and not very bright. I tried using natural pigments (namely turmeric and cinnamon) and probably didn't put enough, and the green was made with crayons but too few to my taste. 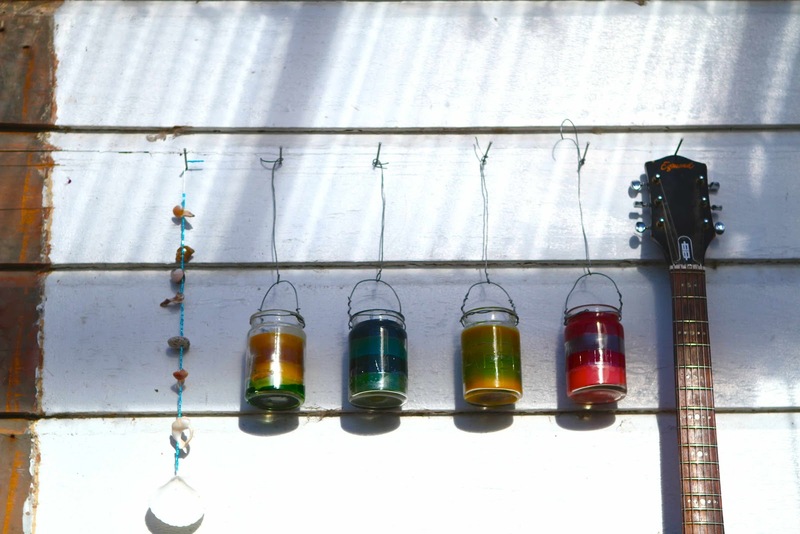 Here are the four candles I made, I was pretty stoked with the results, especially the blue and pink ones. Now for the giveaway... I am giving away TWO candle making kits. 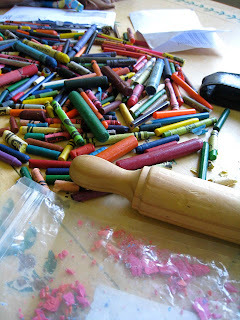 They include a block of wax (about 70g), some 60 ply candle wick and enough crayons to get a nice vibrant color! To enter, just leave a comment. Entries close on the 7th of MArch (in a week). Good luck! these are beautiful.. a wonderful thing to do with children. thank yoU! I am shocked you weren't swimming in entries! Hum bug that I've arrived late.